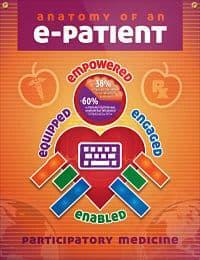 E-Patients are using the power of the internet to gather pertinent information related to their medical condition. Online guidance is sought out by patients and care givers. There are several MPN patient communities that offer us the opportunity to track the latest developments and new therapies. Collectively, smart patients now have the resources to stay on top of our diseases (Polycythemia Vera, Essential Thrombocythemia and Myelofibrosis) and offer suggestions to our doctors at the local level. The typical hematologist needs to stay on top of dozens of different forms of Leukemia (acute and chronic), each with their own sub-type and possible gene mutations. As rare as MPNs are, your “local” doctor might see few very patients with your disease. By using resources like PV Reporter to target specific information using MPN Search, you can be armed with the latest research to share with your doctor and work collaboratively on a treatment plan. Online patient communities provide information, support and coping skills that are particularly beneficial to patients with rare diseases. This video provided by Institute of Medicine explains it best and shows this is becoming a nation wide healthcare trend.